Growing up in Florida in the 1950’s we had no air conditioning – just window fans. Windows were opened at night and shades closed in the day. Now I live in Colorado where few folks have air conditioning and I was born in the tropics. So it might be easy for me to say take the heat. But seriously, self-talk or sweet talk yourself into being “cool” even when its hot outside! Eat locally sourced food and buy products made close to home. Items don’t have to be flown or trucked in and there is less packaging. Fresh food is also more alive and better for you. Visit farmer’s markets and support local growers. Eat Fresh! Allow your computer and other devices to sleep when you are not using them. It’s an energy saver, good for the life of the battery and for the the earth too! Reduce waste: buy minimally packaged goods, reusable products, and recycle. For every pound of waste you eliminate or recycle, you reduce emissions of CO2 by 1 pound. Cutting down garbage by half of one large trash bag per week saves at least 1100 pounds of CO2 per year. Making products with recycled materials uses 30 to 55% less for paper products, 33% less for glass, and 90% less for aluminum. 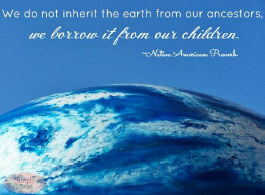 The earth is our mother. She nourishes us and provides our sustenance. Nature is the great rejuvenater bringing new life each Spring. She transforms and recycles even the smallest leaf. Being in nature connects us to each other and to the magnificence world around us. We are so fortunate to live in the garden planet!